Garden catalogs have arrived in the mail and we’re dreaming of fresh-picked vegetables. Now what? 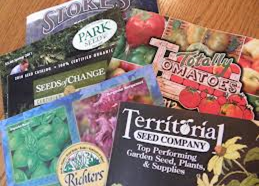 Join the UCCE Master Gardeners of Trinity County in “Planning Your Vegetable Garden”. This free, informative workshop will cover things you can do this spring to improve and test your soil, what to plant, crop rotation, how many seeds or plants to buy, how much space you’ll need, when to start your plants (in pots and in the ground), what to do if a frost threatens and more. We’ll have handy tips for both novice and experienced gardeners and refreshments. The workshop is on Saturday, January 25th from 1 pm til 3 pm at the Weaverville Fire Hall (125 Bremer St). For more information about the workshop, contact Carol Fall, UCCE Program Representative, at cjfall@ucanr.edu or 623-3746.